This is what we do when we get to the end of the playdough, when it all gets stuck together and is starting to feel sorry for itself! This is the end of the glitter dough that we have been playing with for a few months now! I set up Emma’s table with an ‘assortment’ of dried pasta, rice, sunflower seeds, dried food that will be easy to push and squish into the dough. I tried to find a range of different textures and shapes – because it’s fun and because it was in the store cupboard! First we made little balls of dough and ‘hid’ treasures in the centre. Then we got really creative and made little cakes with decorations on the top. Once we had made all our cakes and cookies, we needed to cook them so I added a few Emma sized pots and pans! Emma cooked and played and squished! Then… we added water because we definitely needed to make play dough soup! We really enjoyed this activity. 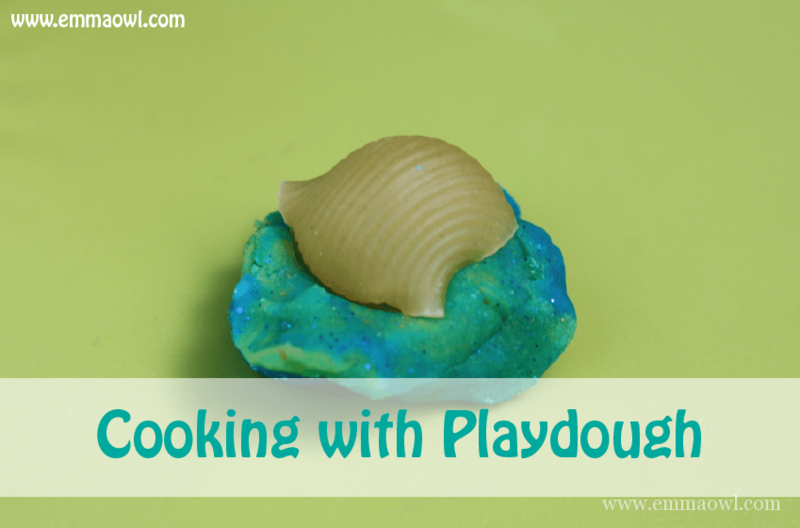 It was creative, it allowed Emma to play with playdough and “cook” at the same time and it’s a great way to use up the ends of playdough that you would ordinarily throw away! We also ate the dried pasta along the way… because this is also fun… and so good for our teeth!! Making your Own Play Dough is so Easy! Here are some of our Top Homemade Play Dough Recipes! I tried this and it works a treat, thanks!